December is all about holiday crafting, so let’s keep this craft party going with a pretty Christmas wreath! Let a Victorian postcard inspire a holiday wreath with an air of mystery and a touch of romance. 1. Cover the wreath form by pinning the end of a strip of teal silk to the back. Wrap the fabric around the wreath form and pin the end in back. Repeat with the second strip until the wreath is covered. 2. Embellish the left side of the wreath by wrapping the organdy ribbon several times around the wreath, tying on the furniture key, and finishing with a bow. Follow with metallic tinsel cord, wrapped and tied in a knot. Hot glue a 3” piece of tinsel garland to the wreath. Reassemble a large silk flower, placing a brass gear topped with a flower sequin in the center. Attach to the wreath with a pearl head pin. Repeat to make a second flower. Wrap the organdy ribbon several times around the wreath and tie the ends in a knot. Pin the snowflake brooch to the wreath and secure with hot glue. Remove the shanks from the buttons with the wire cutters and glue around the snowflake brooch. 3. Embellish the upper right side of the wreath by wrapping alternating ribbons several times around the wreath and finishing each with a knot. Slide a pearl head pin through the center of a watch face, the center of the cutting wheel, and into the wreath. Tie on the cameo brooch with gold ribbon. Tie a gold bow onto the heart charm and pin in place with a pearl head pin. Layer a washer over a flower sequin and pin onto wreath with a pearl head pin. Repeat to make two more. 4. Decorate the lower right by wrapping the wreath with a strip of sheer crinkle fabric, securing it in back with straight pins. Cut two silver leaves off the poke and pin them onto the wreath with straight pins. Create three layered flowers on top of the leaves, one with a coin and watch face center, one with a gear and sequin center, and a small one with a flower sequin center. Attach them with pearl head pins. 5. Punch a hole in the top of a vintage postcard and set with a gold eyelet. Tie a piece of 1/8″ wide gold ribbon through the eyelet and tie it in a bow. 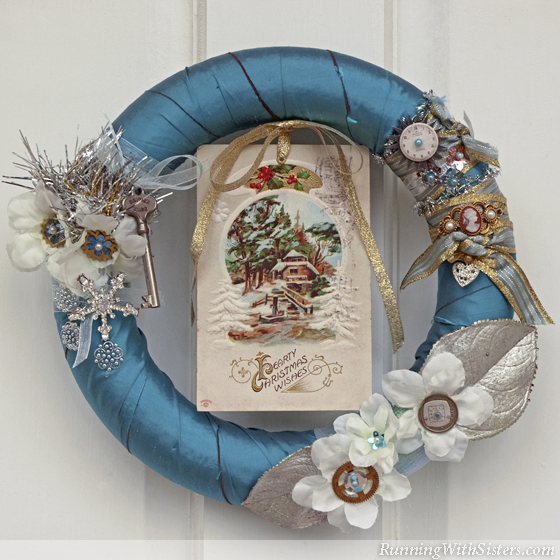 Use a straight pin to attach the bow and postcard to the wreath form. Create a wire hanger by bending floral wire into a figure 8 with a large loop on top and a small loop on the bottom. Push a straight pin through the small loop and attach to the back of the wreath form. One-of-a-kind Finds: When it comes to crafting with flea market finds, there’s no need to be exact. Use this wreath as a jumping off point and let your own wonderful finds be your guide.